Those Penn engineers keep coming up with really cool, must-see technology. So far, we've seen Penn robots that can fly, robots that throw out the first pitch at Phillies games and robot lamps that corresponds to your heart rate. But how about award winning robots that can play soccer (and pick up and throw a soccer ball)?! After the jump check out this awesome video showing why the Penn and Virginia Tech team placed first! Recently, Penn and Virginia Tech's Team DARwin (“Dynamic Anthropomorphic Robot with Intelligence,”) won first place in the Humanoid Kid Size competition at the 2011 RoboCup tournament in Istanbul, Turkey. 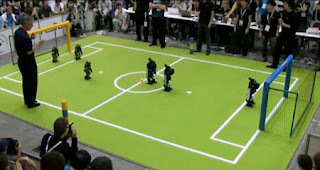 Penn developed the software framework that provided each robot with artificial intelligence (AI) which guided the robots' walk, vision, and gameplay.